Although it has long been recognized that Hawaii’s burden of taxes is amongst the highest in the nation, one has to recognize that the tax system is of high quality with a balance of the three major taxes. While lawmakers have eroded the quality in recent years with such components as tax credits for which there is no obvious burden to relieve, the overall system is well balanced with the three major legs of the tax stool being the income tax, general excise tax (sometimes called a sales tax), and the real property tax. The income tax recognizes the taxpayer’s ability or inability to pay this tax as it is based on the amount of income earned or received as rates are graduated, rising with the amount of income earned. The general excise tax is a tax on consumption and like all taxes based on transactions, the general excise tax, like a retail sales tax, tends to be regressive. That is, the tax takes a larger percentage of a low-income family’s budget than it does a higher-income family’s budget. This is because nearly all of a low-income family’s budget will be spent on consumption. The higher-income family will be able to save and invest their discretionary income where there is no general excise or sales tax. Because the real property tax in Hawaii is not utilized to support some of the services that the property tax on the mainland supports, property tax bills are usually not as large as those found in many mainland jurisdictions. 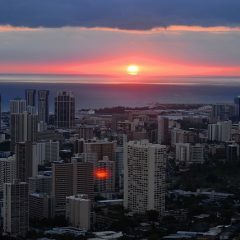 However, because Hawaii’s real estate market is quite active and the supply of residential and commercial real estate is limited, the valuations appear to many as being astronomical. Further, once a person’s mortgage is paid off, the real property tax is billed directly to the homeowner semiannually. This means a substantial chunk of change is paid out every six months, drawing the ire of those who now see their real property tax bill in a lump sum instead of smaller monthly payments. Then there is the plethora of taxes imposed in-lieu of the three foregoing taxes. The public service company tax is imposed on public utilities like the electric, gas and telephone companies in lieu of the general excise tax and the real property tax. This is because their income and property would be more difficult to administer and comply with if they were subject to the general excise and the real property tax. In the case of the latter, the difficulty of figuring out what the value of the real property is for the easements and rights of ways over which the utility’s lines and cables run would be an absolute nightmare. In the case of the former, the definition of gross income would have to address issues such as fuel surcharges that the power generating utilities pass on to customers, or in the case of the telephone company, the fees and surcharges imposed by the federal and state governments. Those charges or surcharges are not kept by the utility company but are remitted to the person selling the oil or gas or the federal or state government in the case of fees charged by the telephone company. Then there is the financial institutions franchise tax imposed on banks and other financial institutions. This is a tax imposed in lieu of the general excise tax and the net income tax. Obviously, not all the money a bank collects belongs to the bank so what is considered gross income of a regular business, that is every penny that goes into the cash drawer, is not so in the case of financial institutions. Similarly, all of the income generated does not belong to the bank because some is paid out in interest income to its customers. Then there are taxes that are imposed on the users of certain public facilities where the use is reflected in the amount of taxes paid. These include the transportation taxes such as the fuel tax and motor vehicle weight tax which are dedicated for highway construction, repair and maintenance. Inasmuch as there is a direct correlation between the amount of tax paid and use of the roadway, there is validity to earmarking these taxes for highway expenditures. For example, the more fuel taxes a motorist pays translates into more miles driven on the state’s highways and heavier vehicles tend to put more wear and tear on roadways. Then there are those taxes which were never meant to be earmarked but because lawmakers didn’t want to take money away from their favorite programs but felt obligated to fund new politically popular initiatives, ended up earmarking what were general fund receipts for these special programs. These taxes include sin taxes, like those on the sale of cigarettes, and the conveyance tax which is used to salve the demand for affordable housing and the protection of the environment.